mention 2 methods in the class. Lerp and SmoothStep are 2 methods in the MathHelper class that can assist us when trying to change from one value to another. If an object is going at one speed and needs to slow down to another there should be be a smooth transition between the 2 speeds. Or perhaps something needs to change from one value to another at a constant rate. These are the functions for you. Lerp is short for Linear Interpolation, it makes a straight line between 2 values that you provide and gives you the value on that line at the percentage you pass it. It is the red line in the graphic. 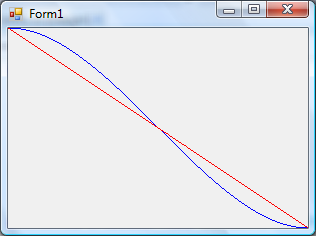 The second method is SmoothStep, you invoke it the same way as Lerp, by passing a low, high and percent (0.0-1.0) value. The difference is in the value it returns. As it’s name implies, the value steps down smoothly from the first value to the second using a cubic function. It’s example is the blue line in the graphic. So the next time you need to go between 2 values and you can determine how far into the transition you are, you can use one of these 2 methods to make a better transition.